Ryuso Ichiban-ya, an enterprise that offers customers a chance to dress up in a Ryukyu Kimono for a feel of ancient times and a memorable photo, is located just in front of the Zakimi Castle ruins in Yomitan Village. 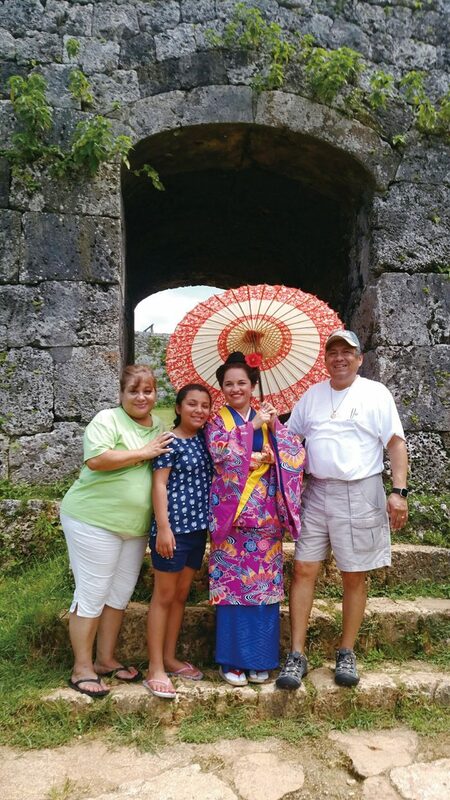 The company has kimonos for both men and women, and the ancient Zakimi Castle ruins, a registered World Heritage Site, is a perfect background to a picture that forever reminds of their stay in Okinawa. A couple wearing Ryukyu Kimono poses for memorable pictures at the World Heritage Zakimi Castle ruins site. Because it’s a World Heritage site, and thus a popular sightseeing spot, the surroundings are kept very clean and are well cared for, and the site gives visitors a very nostalgic Ryukyu Kindom era feeling. After dressed up in a traditional kimono and the hair and makeup finished by a professional, the customer is free to walk around the castle site and take pictures either by him or herself or, of course, request a professional cameraman to take them. Depending on the photo plan, one can take a walk on a beautiful beach in Yomitan or select a special shore spot for the pictures. Ryuso Ichiban-ya also accepts business visits to dress participants in kimonos for a wedding ceremony or any other occasion. 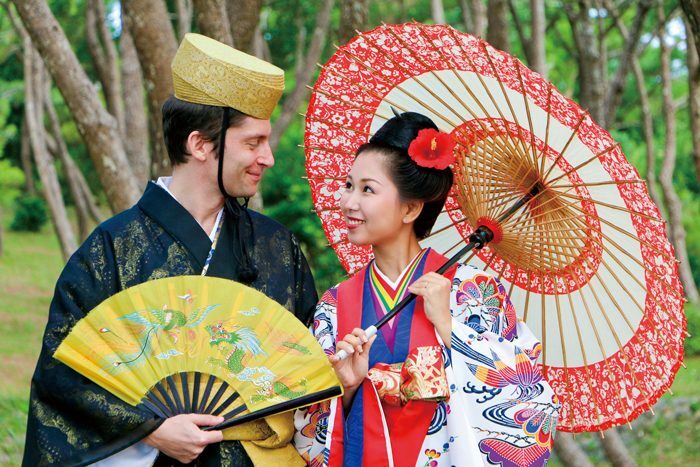 Currently, wedding photo sessions, in which the new couple wears Ryukyu kimonos, are very popular. 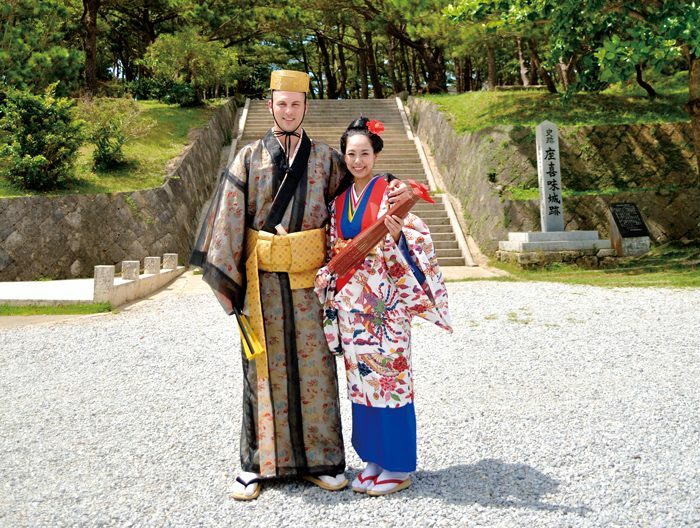 A photo of the new couple wearing Ryukyu kimonos on the welcome board at the entrance to the venue of the wedding is also very popular, as are photos of the couple in kimonos at various locations around Okinawa inserted in a video introducing the couple. “Recently, foreign customers have increased, and we are very pleased,” Shinji Satake, the owner of Ryuso Ichiban-ya, says. Satake explains that he opened the business because he wanted to offer tourists a chance to try wearing a piece of Okinawan culture in the form of the traditional kimono, and create good memories of the island as much as possible. Ryuso Ichiban-ya is located at 248-1 Zakimi, Yomitan Village, Okinawa. 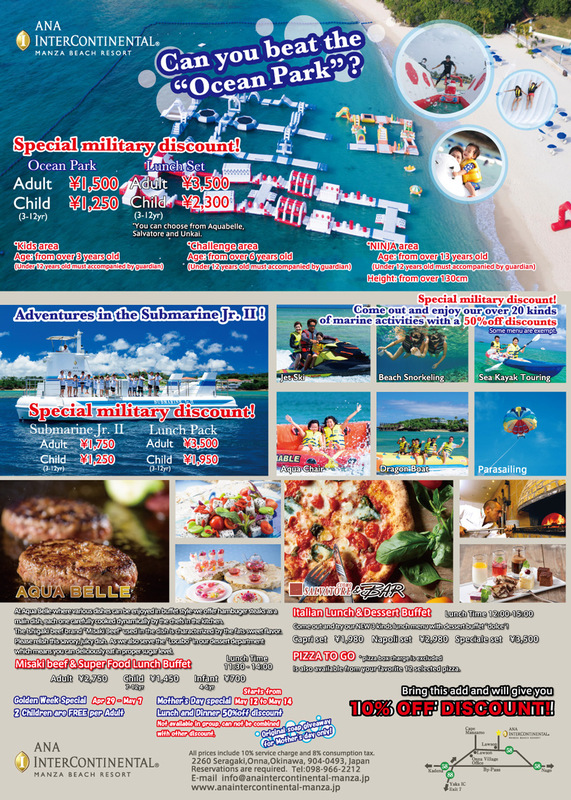 Reservations are available on the website http://ryuso1ban.com/ and on facebook at https://www.facebook.com/ryuso1ban Their telephone number is 098-923-3763.